The 30 mentors include leaders from the Carbon Trust; Amazon Business UK; INSEAD; Laing O'Rourke, Honeywell Aerospace and RICS. 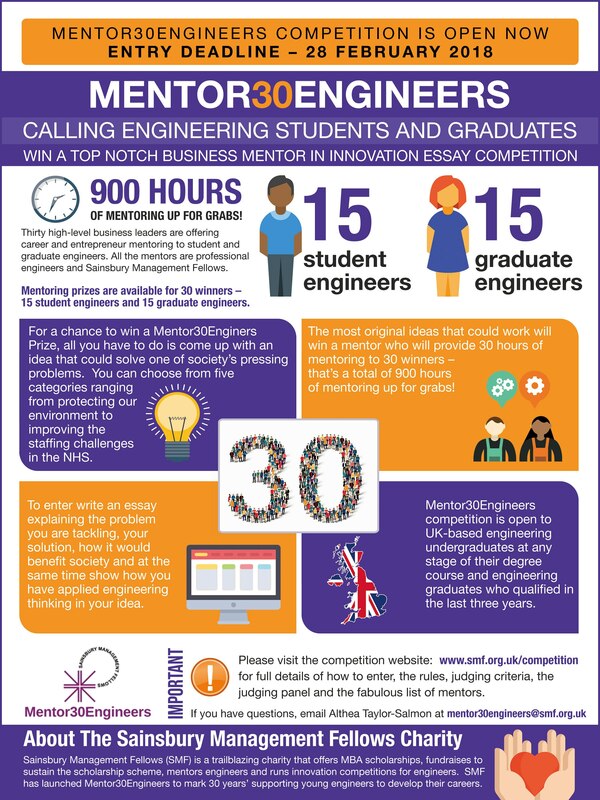 Engineering students and graduates can win a business leader as a mentor by developing stand-out ideas to solve some of the toughest problems in society. Thirty business leaders have volunteered to be mentors in the new innovation competition, Mentor30Engineers. The 30 mentors include leaders from the Carbon Trust; Amazon Business UK; INSEAD; Laing O'Rourke, Honeywell Aerospace and RICS. Mentor30Engineers has been set up by charity Engineers in Business Fellowship, the charity that awards the Sainsbury Management Fellows MBA scholarship which allows engineers to complement their engineering skills with a business education. Mentor30Engineers is designed to inspire a passion for business innovation and education. The competition is open to UK-based students and graduates from any engineering discipline and undergrads can be at any stage in their degree course. Full entry details are available on the EIBF/SMF website or entrants can contact the organisers at mentor30engineers@smf.org.uk. Entrants select one problem from five areas - Healthcare, Environment, Social Care, Finance and Corporate Tax – develop and then describe their innovation in an essay. The entry deadline is 28 February 2018. The judges are looking for originality, the feasibility of the ideas and evidence of engineering skill in the ideas. Entrants with the best ideas will win a leading business mentor - all were recipients of a Sainsbury Management Fellows MBA scholarship award. Each mentor will provide 30 hours of mentoring, supporting students throughout their degree period or through the early stages of their career. The judging panel comprises Sainsbury Management Fellows including President, David Falzani MBE, CEO of Polaris Associates and an honorary professor at Nottingham University Business School; James Raby, a venture capitalist; Cathy Breeze, SMF Director of Communications and entrepreneur Dr Robin Jones, a partner at Endeavit. Completing the judging panel is Chris Earnshaw OBE FREng, Chairman of the RAEng Steering Committee for SMF who said, "The Mentor30Engineers initiative provides access to an amazing range of expertise and experience from people who have themselves been successful in business. 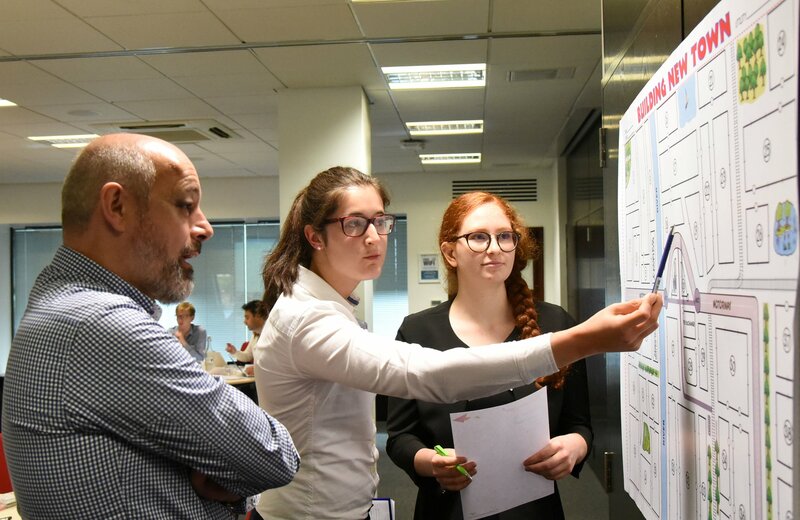 It is also a great example of how those who have benefitted from SMF Awards are able to widen the impact of the scheme by reaching out to the next generation of engineering leaders who have a passion to address some of the major challenges facing society today”. 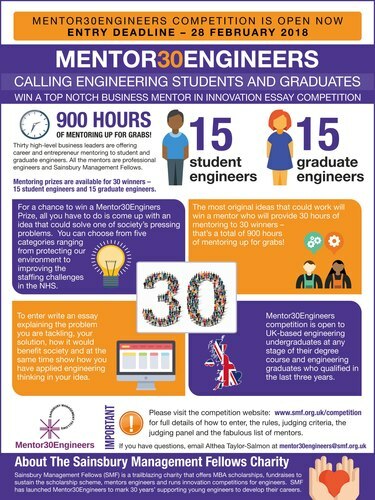 The winners of Mentor30Engineers will also attend a prestigious Annual Dinner in May at which Lord Sainsbury, founder of the SMF Scholarship Award, will be the keynote speaker. The charity, Engineers in Business Fellowship runs the Sainsbury Management Fellows scholarship and annually awards £300,000 in scholarships to engineers to allow them to study for an MBA at the top international business schools.